How might the experience of a trip to Mars differ in comfort and heath impact from a stint on the ISS? A comment below the question How will they mitigate the effect microgravity in the BFR on manned trip to mars? suggests that the trip might be as short as 3 months, which is significantly shorter than the typical 5-6 months spent on the ISS. So far, it seems that it is likely to be a similar microgravity environment with no Coriolis-laden rotation for artificial gravity. There will be more radiation since Earth's magnetic field will be far behind, and that's been well discussed on this site and a bit by Elon Musk; for energetic solar events there will likely be shielded areas where the occupants can retreat for the duration. So it sounds like while there may be "nicer" accommodations (e.g. "cabins", perhaps even with reasonable facsimiles of doors instead of what they have now (see GIF and GIF) will the physical environment "feel" in any way significantly different on an interplanetary mission than an orbital one? I can't think of anything beyond the availability of specific creature comforts that might be installed, are there any that would be the direct result of differences between an Earth-orbit experience and an interplanetary experience? Depending on how successful the as-yet-untried art of appendectomies in freefall turns out to be, the difference in health impact may be large. Update: Just a few days ago MIT held a workshop on this topic. From Psychology Today's Stressed? Just Imagine Going to Mars; Workshop to explore loss of privacy, use of digital technologies in space. The first astronauts needed the Right Stuff as they launched into Earth orbit. A new generation of astronauts will need much more as they travel to the Red Planet, facing unprecedented stresses on their much longer missions. This week researchers will gather in Cambridge, Massachusetts to develop concrete ways to design spacecraft to be hospitable environments. “Future space missions take crew members further and longer from the comforts of Earth in space flight vehicles that are relatively smaller compared to the International Space Station. 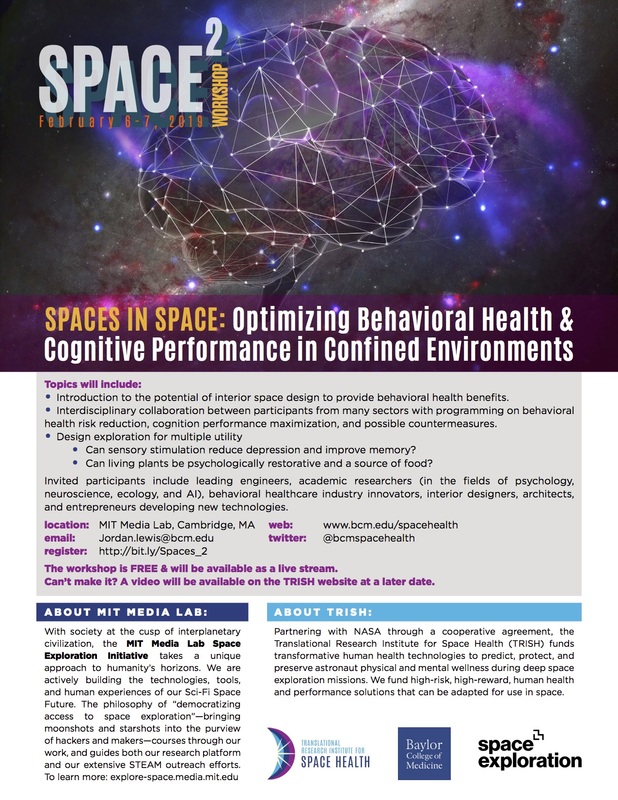 These isolation and confinement hazards create behavioral health and performance risks to the crew that we want to address in a meaningful way with habitable vehicle design,” said Dorit Donoviel, director of the Translational Research Institute for Space Health (TRISH), which is sponsoring the meeting Spaces in Space: Optimizing Behavioral Health and Cognitive Performance in Confined Environments. The workshop, called Space2 for short, will take place February 6-7, 2019 at the MIT Media Lab, which is also sponsoring the event. Sessions will be freely available by livestream for anyone who registers. The block-quoted text is from the Seeker article Hre Are the Five Biggest Dangers NASA Astronauts Face which draws directly from those five NASA podcasts and transcripts linked abvoe. NASA is also looking at countermeasures to reduce radiation risk during long missions. “If you can get there faster, that’s probably the biggest thing... because that minimizes the time you have to spend in space,” says NASA scientist Zarana Patel in the podcast. So more efficient propulsion might be one way to reduce exposure. Future spacecraft could also make use of magnetic shielding to protect the crews. Or perhaps there’s another technology out there that hasn’t been invented yet. Seniors, people with disabilities, and people living in harsh environments all face a similar issue — isolation. If there are few options to leave your house and see other people and participate in what many consider “normal” life, it’s difficult for humans to function psychologically. In space, that isolation is also extreme. Astronauts must remain inside of a small space station for six to 12 months at a time, only going “outside” during a spacewalk — and that’s if they’re lucky and have one scheduled. [...] One sign of crew stress shows up in how they sleep. One research study cited in the podcast showed that in a sample size of 21 people, crews on the space station aren’t sleeping well roughly 29% of the time. (To put that in time perspective, that’s roughly two months out of a six-month mission.) NASA is still trying to figure out how to help astronauts adapt to isolation and a strange environment. NASA already has its crews trained in basic medical procedures in space, so they can deal with many common issues by themselves. This not only cuts down on superfluous calls to the ground, but the astronauts can also report symptoms precisely instead of giving a vague description, says NASA astronaut and former flight surgeon Mike Barratt. [...] The best way NASA can think of to manage problems is to have as much expertise on the crew as possible. One of the ways that they manage risk is to say that every planetary mission must include a physician-level crew member on board. Another way is to look at the history of space exploration, as well as similarly remote environments such as submarines and Antarctica, to see which human health problems come up the most. A surprise one was urinary tract infections, which affect men in space far more often than on Earth. So NASA is building up its database to try to keep its astronauts safe. “On muscle and bone, you have de-loading effects which can be mitigated by extensive exercise,” says NASA’s Peter Norsk. NASA is especially concerned with how a lack of gravity and increased space radiation could hurt explorers on the way to the moon or Mars. On Earth, we are protected from most forms of radiation due to the atmosphere; in space, explorers in low-Earth orbit still get a little less radiation than in deep space due to Earth’s magnetic field, which deflects some radiation from space. But on the way to Mars, that’s not the case. Norsk said that doctors still don’t understand how radiation can affect astronaut bone and muscle. It’s hard to simulate deep-space radiation on Earth, and we only sent a handful of astronauts to the moon back in the 1960s and 1970s. One of the things that hurts astronauts in space is the loss of a regular “day” in space. The sun rises and sets 16 times in 24 hours aboard the ISS, because astronauts hurtle around the Earth once every 90 minutes. While crews do as much as possible to keep their bodies to a schedule – like eating at regular times and having firm sleep periods – it’s pretty difficult to fool the brain when light and dark keeps changing outside the window. Right now, doctors are trying to better firm up the circadian cycle by improving sleep for astronauts, which means reducing noise, making their schedules less stressful in the evening so that they can wind down, and taking other measures. Not the answer you're looking for? Browse other questions tagged spacex crewed-spaceflight interplanetary or ask your own question. How will they mitigate the effect microgravity has in the BFR on manned trip to mars? How many tons of water is needed to surround ISS's living modules, so the rate of radiation exposure will be the same as on the surface of Earth? How do we make a round-trip journey to Mars? How do the sizes of the various proposed manned capsules differ? Could the ISS be propelled to Mars? How big is the risk/potential damage from radiation on a Mars trip? How does SpaceX plan to deal with boiloff on the trip to Mars? How does the speed and volume of particles differ in producing thrust in space?